Price Waterhouse Cooper issued 'Will You Handle the Curve? Global Automotive Perspectives 2008' In September, as the latest financial meltdown sent U.S. automotive sales plunging, and the Big 3 asking for a piece of the TARP! The report says "... 2008 is shaping up to be a year marked by profound industrial shifts and strong headwinds for the automotive industry, as global players respond to a fast growing array of financial and regulatory pressures. Such constraints include increasing fuel economy and/or drastic CO2 emissions mandates, rising commodity prices, a weakened US dollar, changing consumer preferences, and liquidity concerns. Nonetheless, tremendous opportunities exist for automakers and suppliers who are prepared to deliver swift and viable solutions to the industry's current transformation ... The ability of Western automakers to strategically position themselves between mature and emerging markets represents a clear challenge in today’s global automotive environment. Achieving a balanced global footprint is particularly critical for the Detroit 3, which must undertake massive domestic market realignment efforts as consumers abandon traditional truck-based vehicles and begin favoring more fuel-efficient car-based autos. In addition to satisfying changing domestic demand, the Detroit automakers’ rationalisation measures must be completed in a period of reduced credit availability and fragile financial outlooks." True in spades! 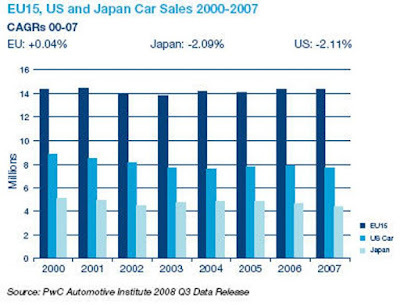 From the first graph we see that vehicle sales in 'mature' markets (i.e. the "core" EU countries, Japan, and the United States) has been flat for quite some time. Virtually all (volume) growth for the automotive sector has been in the emerging markets, and the need to be competitive in these markets is critical to continued growth of the automakers (the report estimates that four countries - Brazil, Russia, India, and China - will account for 58% of the volume growth through 2015...). The Congress has already approved USD 25 billion in funds for the Big 3, to help in the development of more 'environmentally-friendly' cars, and the Big 3 are pushing for additional TARP funds to help them through the current crisis. The Democrats appear to mostly be in favor of the idea, and it is very likely that some sort of large assistance package will be forthcoming. Rather than just shoveling a mound of cash into the pockets of the Big 3, perhaps the Congress can/will take a long, hard look at the industry and decide what (if any) the long-term role of the government should be in this area. Otherwise, once through this crisis it is highly likely that the Big 3 will be back at the Congressional pump to be re-primed in a few years! However, this blogger isn't holding his breath in anticipation of them taking a long-term view!